US Dressage Team Veteran Leslie Morse has announced the passing of her beloved World Champion Team Bronze medalist, and multiple US National Champion, Tip Top. The 24-year-old Swedish “A “ approved stallion was humanely put to sleep on Thursday, May 31, 2018 due to testicular cancer. Tip Top had been diagnosed with this disease about a year ago. At that time, Leslie decided to have him live out his remaining life in the most happy and healthy way possible. Which is exactly what he did to the end. "Tip Top has spent his last seven years watching babies play in the fields, enjoying trail rides, grazing in his pasture, and visiting friends laden with carrots, apples." "He loved his well earned retirement after a brilliant and successful career." said Leslie. "When I retired Tip Top in 2011, we had been travelling the globe together competing in the international arena for eight years. Tip Top, a very internal and thoughtful horse, entered every arena, be it a large, international stadium or training at home, with a bold, unique sparkle. He gave his all to every outing, and brought out the very best in me. Tip Top 962 was the first horse ever to win the Swedish Young Horse Championship three years in a row. winning 1 million Swedish Krona. Tip Top 962 held the spotlight again from 2003 - 2010. 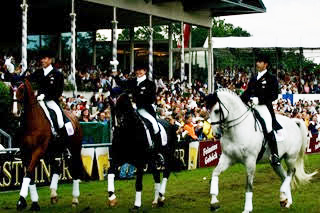 In 2004, with Leslie Morse won the US National Championships at the PSG/I1 level and later that year went on to compete in Europe at the largest shows CDI Hagon, CDI Lingen, CDN Wickrath earning top placing his first season out at the Grand Prix level. 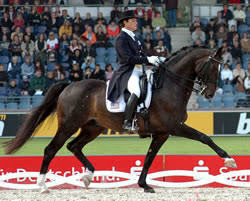 Parade of Nations Aachen Leslie Morse and Tip Top with teammates Guenter Seidel and Robert Dover. In 2006 Tip Top 962 again made it to the big time, competing at the 2006 World Cup Finals in Amsterdam and 2007 World Cup Finals in Las Vegas . That same year, Leslie and Tip Top competed at the World Equestrian Games on the US team earning a team bronze medal at Aachen Germany. 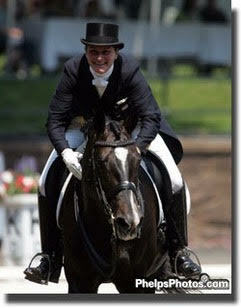 In 2009 Tip Top again went on to win the US National Championships giving Leslie a fifth title win. From there they flew to England for training with Kyra Kyrklund & Richard White. 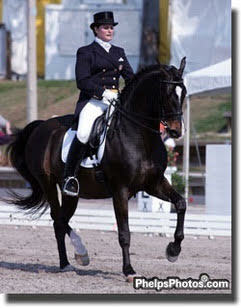 He went on to win the 2009 Masters CDI Hickstead Special and then the Masters CDI in 2010 Wellington Florida Special. 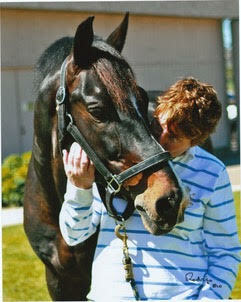 "Tip Top 962 has had a very large life and has brought joy to me and to all who have watched him. His offspring will be caring on his legacy for years to come but this one-of-a-kind stallion, my one-of-a-kind partner, will be missed forever. I would not be the rider I am today without him."